Breviloquent x Vouchercloud = Happy Codes - BREVILOQUENT. Lets agree to disagree, or disagree to agree. But the point remains Being a woman is tough. For all the shopping we have to do, to finding the apt sales, to looking for vouchers and coupons to be able to buy more yet spend less, it's a tough task. While being a woman is tough, being Fashion Blogger is tougher. When you know so many eyes are on you and people look up to you and judge you for what you wear and how you wear and where you got it from, shopping becomes a hard nut to crack. But Actually, for the most part, I’m not a big bargain hunter or it usually depends on my mood. If a bargain falls neatly into my lap I’ll take full advantage but spending hours trawling the internet for the perfect deal sounds like a lot of work to me, almost as much work as actually going to a shopping mall. Recently launched in India, Vouchercloud is a service that finds coupons and coupon codes for all your shopping needs, helping you Live More, Spend Less. Here’s how it looks like and how I used it. http://www.vouchercloud.co.in/ has a number of options to choose from. Flick through the app to discover exclusive offers for Restaurants, Pubs & Bars, Casual Dining, Food to Go, Films &Theatre, Cheap Days Out, Retail, Leisure & Entertainment, Health & Beauty, Travel & Hotels, Automobile, Home, Garden & DIY, Property and Finance. Once you know what you are looking for, the main category will take you to the coupons from various options/brands available under it. I chose to try the Women's Fashion Coupons to begin with. The brands under the category had me excited. Imagine having all your favorite brands on a single screen. And if that is not enough, each of them had a Voucher Code or a deal that took me straight to the brands page helping me buy more and spend less. The service is easy to use since all it does is to gather all the brands with ongoing offers/Voucher and discounts on your screen while landing you to your favorite brands website to shop from. All vouchers are easy to browse and can be downloaded and used immediately or stored for later use. 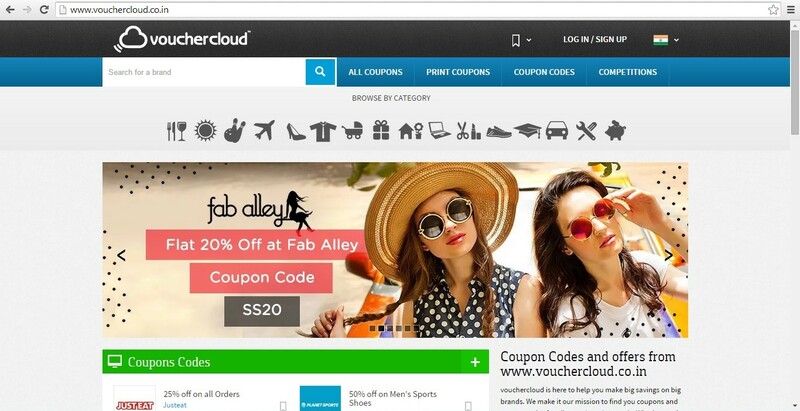 So, if you are a major online shopper and spend lots of time in looking for deals and discounts on individual websites, all you need to do is to follow Vouchercloud and shop sitting in the comfort of your Pj's while munching on popcorn. Follow me on my Facebook Page, Twitter and Instagram to know what i shopped for.